So in otherwise it will be a late promo? TasteOfTerror and MoreMoople like this. anyone good at online advertising? How does one pay you? Cause RMT are not allowed on EMC. I forgot to follow you, sorry about that! ConductorConduit, crystaldragon13, haastregt and 1 other person like this. 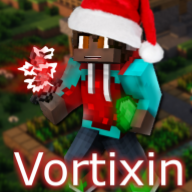 Happy B-day Vortixin!! =D Hope you have a great day! _Bunni__ and synth_apparition like this. Who can sell me a DC of redstone? Dust or blocks? anyone have a /promo turkey slicer they can sell me?